Persons from all parts of the globe have, at some time or other, been acquainted with “Woody Woodpecker”. An ever lovable creature, the woodpecker has certainly made an impression on the minds of children and adults. However, take note that not all Woodpeckers and “Woody” are one and the same. 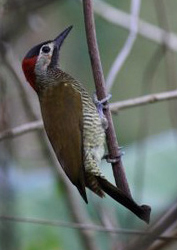 The Golden-olive Woodpecker is one of six species of Woodpecker that can be found in Trinidad and/or Tobago and ranges from Mexico to North Argentina. Its appearance is quite dissimilar to Woody’s. Although this bird has a red crown, it lacks the prominent crest that is a trademark of the cartoon character. Its underparts are barred black and yellow while its upperparts are olive green with a golden cast, hence its name. In fact the name rubiginosus means “full of rust”, illustrating the colour of the bird’s wings and back. This Woodpecker is also smaller in size, measuring about 7.5 inches. Nevertheless, this “Carpenter Bird” as some locals call it, remains true to its name. It can be seen pecking away at Bois Canoe, Hog Plum and many other trees. Peck, peck, peck it goes, all to make the trunk a home. The Golden-olive Woodpecker feasts on fruits and berries but its meal of choice always comprises insects. It has characteristics which work to its advantage when searching for insects in trees. One such feature is its barb-tipped tongue that it uses to collect hard-to-reach wood-boring beetles, if it so pleases. While wandering the trails the sound of a loud “greep” usually signifies the presence of the one and only Golden-olive Woodpecker. Normally found singly or in pairs, the picarian creature is not a peculiar sight at Spring Hill Estate. ffrench, Richard. 1991. A Guide to the Birds of Trinidad and Tobago. Hilty, Steven L. 2003. Birds of Venezuela.